Visit www.ntsc.ca and log in. The next few trips are displayed on our home page , under "REGISTER FOR DAY TRIPS BY BUS", as well as on the "Day Trips" pages. Click on the trip you would like to go on. The event page displays information about the trip (Resort, Bus Pick up times, and cost). Click the blue "Register" button on the left side. 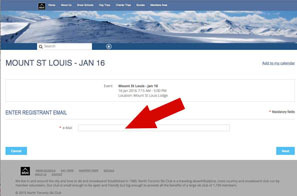 Enter (or confirm) your email address on the next screen. Click next. 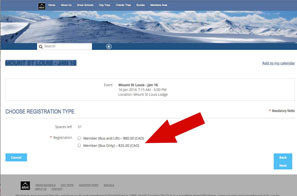 Choose Member (Bus and Lift) and click next. 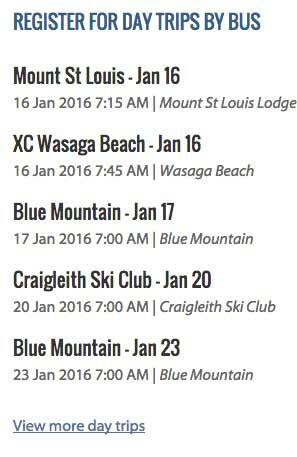 If you don't want a lift ticket, choose Member (Bus only) instead, and click next. 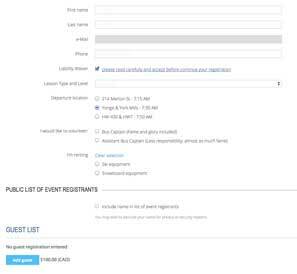 If you would like to register a guest, click the Add Guest button, and enter their information. To pay the full cost of the trip against an existing account credit click "Invoice me", the cost of the trip will appear to be deduced from your balance but you must still continue to step 10 below. To pay part of the trip cost against an existing account credit continue to step 11 below. You will receive a booking confirmation email (note this is NOT a payment confirmation). 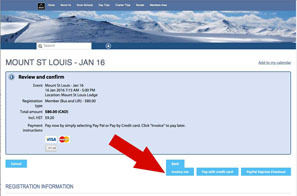 If you are paying online with a credit card or with Paypal, enter your credit card or Paypal information on the payment screen. When payment completes you're all done! You will receive a payment confirmation email. If you are paying the full trip cost against an existing account credit you must "settle" the invoice for payment to be processed. To settle an invoice click the "Messages" popup box in the bottom right corner of the screen, then click "Balance". This will take you to your member profile - Invoices & Payments page where you will see all your invoices. Click "Settle" at the top of your profile to complete payment against your account credit so the bus captain knows you have paid. Note you will NOT receive a payment confirmation email when settling against an existing account credit. 11. If only you have a partial credit (ie: a credit that doesn't entirely cover the cost of the trip), it may not be deducted automatically from your account balance. 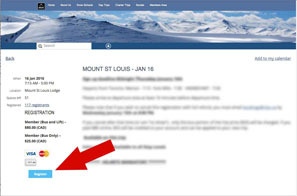 If you need to cancel your trip, follow the instructions posted in the event before the deadline. Otherwise, or if you are a "no-show", you will be charged a "No Show Fee". You will receive a credit for the lift ticket only, if you chose Bus & Lift. Click on your name, then click "view profile" in the pop up.